Few things are more humbling than to properly place ourselves in the story of the Passion of Christ. We are among the disciples who fled after the arrest at Gethsemane. We are with Peter in the courtyard, denying our Lord. We are in the crowd, calling out, “Give us Barabbas!” We are cynically washing our hands, like Pilate. We are twisting together the crown of thorns and mocking him. We are casting lots for his garments. Out of such humility, however, there emerges an essential truth: We could never do this for ourselves. We have no power to restore a right relationship with the holy and righteous Lord God. We need the Cross. It is why, despite the horror of an innocent man, who was also God, betrayed, mocked, scorned, spit upon, beaten, executed, we can still call the Friday just past Good. Always it will be a solemn day, and yet a good day. But we also need the Empty Tomb. What extraordinary irony in that phrase! 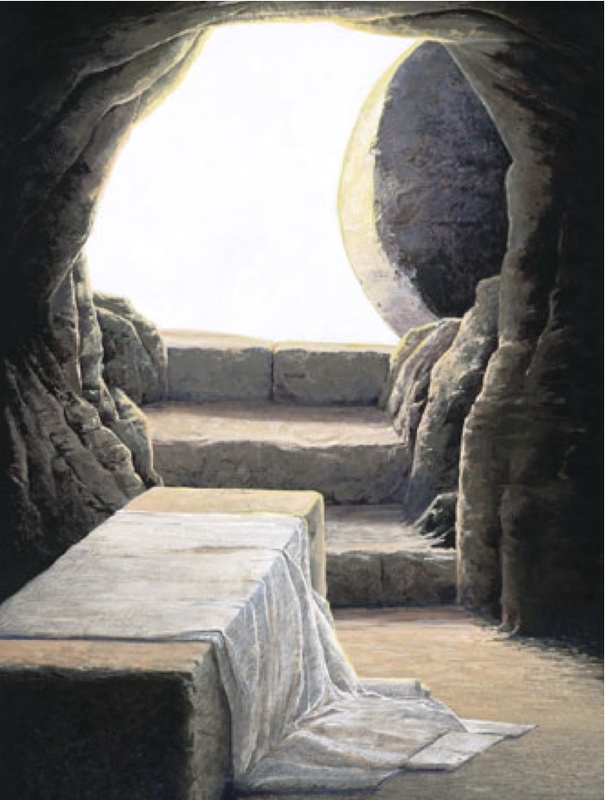 In a sense, and with apologies to grammarians, nothing was less empty than that empty tomb. The celebration on Easter morning presents countless aspects for contemplation and rejoicing. It abounds with meaning. I’ll mention one aspect. The Resurrection demonstrates conclusively that the sacrifice was acceptable. “It is finished,” He said. And the Risen Lord is certain proof of his Lordship, his conquest of sin and death. They are vanquished. Just a couple of interview links for those who like to listen to things. My interview with Eric Metaxas became available this past week, and you can hear it here. It's about forty minutes long. A much shorter interview with British talk-show host Justin Brierley, almost entirely on Acts, was tacked onto the end of a show here, starting about 1 hr., 9 1/2 minutes. I'm also pleased to announce that a Kindle version of Hidden in Plain View is "in the works." I don't have a release date for it but hope it will be out within a couple of months. Of course, don't let that stop you from buying the physical version if you are so inclined! A joyous on-going Easter season to everyone! Today is April 22, 2017. Do you know what that means, in human terms? Everyone should know what today is, because today, in a special way, we entertain a vision of a better future for everyone. It is, in fact, an inevitable future. When we authors at W4 started thinking about the tenth anniversary of the blog, various suggestions were made as to who might write what. The idea was mooted that perhaps my contribution to our anniversary series might be a post on what is worse about the world now than when the blog started--an assignment in keeping with my gloomy bent and reputation. Of course there are many possible answers. The homosexual and transsexual agendas have advanced with a speed I never would have predicted ten years ago. Things have gotten to such a pass that a man, now living in Hawaii, has sued the state of Idaho (in federal court) for refusing to let him change his designation on his birth certificate to female, because he identifies himself as a woman. Would that one could laugh this off as a frivolous suit with no possibility of success, but one certainly can’t be sure of that anymore. But what seems to me perhaps the saddest change in the last ten years is the further fragmentation of conservatism in that time period. This new undesigned coincidence is one I ran into myself while reading, in Isaiah 36, a passage that is the same almost word-for-word in 2 Kings--a circumstance for which we don't know the precise explanation. My own guess is that Isaiah came first and that the chronicler of Kings used it. In any event, virtually all of the material for this coincidence is found in I and 2 Kings, which were originally just one book. Nobody knows for sure who wrote it (one theory is that it was Jeremiah), but since it covers hundreds of years of history, obviously the final compiler was using a lot of earlier material and didn't witness it all himself. The indications I will use to resolve a question are subtle and widespread; hardly the sort of thing even a single compiler or author would make up and spread around to make his narrative look more plausible. The coincidence begins with a slightly surprising aspect of the taunts leveled by the Assyrian envoy Rabshakeh against the people of Jerusalem in I Kings 18. This is pretty much classic ANE trash talking. Sennacherib has already conquered several other towns of Judah, is building an empire, and the envoys are trying to create dissension within the besieged city. When those sent out to negotiate with them ask them to pipe down (to speak in a language they understand but the people on the walls don't), the Assyrians yell even louder to the people on the walls, in Hebrew, which they know they will understand.